Arlina Shen, 2018 individual champion, Class 1A girls’ tennis. Photo: Heather Rule, special to the Star Tribune. Forget jewelry or flowers. How about a state championship as a sweet 16 birthday gift? 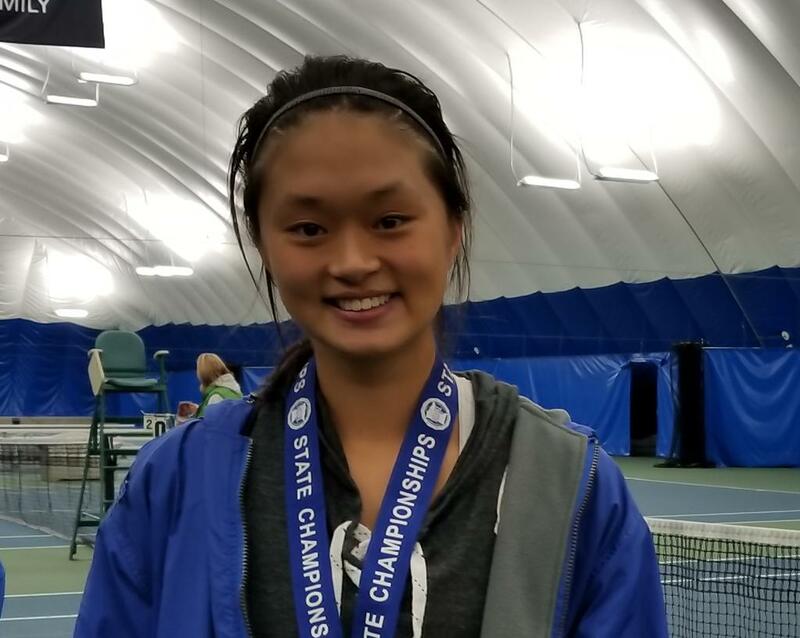 That’s what Blake junior Arlina Shen earned with a 6-0, 6-4 victory in the Class 1A girls’ tennis singles final on her 16th birthday, avenging her past runner-up finishes to Blake teammates. Last year Shen shed tears of frustration and sadness after falling short. But this time, playing Friday at Reed-Sweatt Family Tennis Center in Minneapolis, she found a way in a highly competitive match against No. 2 seed senior Katie Mulvey of Trinity School at River Ridge in Eagan. The tears remained, this time the reason more joyful. Leading 5-3 in the second set with Mulvey serving, Shen had three match points she couldn’t convert. Shen said afterward she thought of her second-places finishes when the match points came up. She even showed some frustration at times on the court, something out of the ordinary for Shen, according to Blake coach Mike Ach. Shen served out the match, clinching the title when a Mulvey backhand shot sailed wide. It ended a match filled with fast groundstrokes, long rallies and eight deuce games. Shen was down love-40 and fought off five other game points before getting the break for a 3-0 lead in the first set during the longest game of the match. Another highlight for the large crowd gathered came when Mulvey held serve in the second set to get within 4-3, taking the game with a 35-shot rally. Sophomore Clare Palen and junior Natalie Allison won their second consecutive Class 1A doubles crown for Rochester Lourdes. As a top seed, they defeated the No. 2-seeded team from Litchfield, senior Shanna Kinny and sophomore Avery Stilwell, 6-2, 6-1.